August 24, 2015 | 1,625 points | The Sensex tanked about 6% and ended over 1,600 points down, the biggest ever in absolute terms. The fall was led by a crash in the global markets. January 21, 2008 | 1,408 points | Marking one of the biggest single–day fall till then, it plunged 2,062 points intraday, recovering a bit later. The key reasons for the steep fall were recession in the US and foreign institutional investors who were trying to reroute their funds to stable developed markets. October 24, 2008 | 1,071 points | The Sensex plunged about 11% or 1,071 points. The main reason for the fall was the RBI policy meet outcome, wherein it did not reduce rates. The fall was further aided by the confirmation of recession in the UK. March 17, 2008 | 944 points | The Sensex tanked over 900 points on deepening global concerns. The valuation at which Bear Stearns changed hands shocked investors as JPMorgan Chase and Co. took over the firm for USD 240 mn. March 3, 2008 | 901 points | The index lost over 900 points on frantic selling by funds, triggered by deepening concern over the recession in the US and budget-related worries. 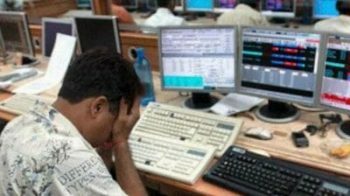 January 22, 2008 | 875 points | Following one of the biggest fall in Sensex a day earlier, the index fell further by 875 points to fall 2273 points in 2 days closing at 16,730. The fall was led by panic induced a day earlier and weak global cues. July 6, 2009 | 870 points | The Sensex tumbled 6.98% intraday or 954 points as the government did not introduce any reform when it presented the Union Budget. The index, however, recovered later to close 870 points lower, or 5.8% to 14,043.4. January 6, 2015 | 855 points | The Sensex plunged 855 points or over 3% closing at 26,987. The BSE benchmark opened at 27,694 and sank as low as 26,937 points, marking the eighth biggest fall in the list. February 2, 2018 | 840 points | Benchmark index witnessed steepest single-day fall in more than a year as stricter tax rules for stock investments and the easing of fiscal deficit targets unnerved investors. The Sensex plunged 840 points or 2.3% to close at 35,067. February 11, 2008 | 834 points | The Sensex plunged 1,007 points intraday and it ended 834 points, or 4.78% lower. The benchmark index closed at 16,630 points on growing global worries over slowing economic expansion. Weak global markets and disappointing corporate earnings affected the market sentiments. Interestingly 6 of the top 10 falls till date were in 2008 with one more in in 2009. Thus 7 of the top 10 falls actually happened within an 18 month window. what about pnote ban fall. This is as per data taken from BSE index. So it is not at my discretion.